I have always had a soft spot in my heart for VWs. Maybe it was because my parents decided to move to another country for job opportunity and arrived off the boat (well, plane) in the 1960s from Germany to start a new life in the USA. Maybe it was because my Papa always loved VWs, and when they moved to the US and settled in Chicago, he got a job at a VW shop that was owned by another German. Well, quite possibly it may have been because I learned to drive in one: a manual 1979 VW Rabbit diesel my father completely restored from ground up. It smelled like McDonald’s french fries when you took off because he retrofitted it to run on a combo of diesel and veggie oil to get better MPG. It was regularly getting in the 60s for MPG, not too shabby, eh—specially for the 1980s. He was ahead of his time, and our family’s love for VWs runs deep. Ride: Both Andy and I find this German wagon ... er ... wagen smooth, solid, and stable. The leatherette seats envelop you nicely and support you as the torque-happy engine takes off. I forgot how much fun it was to drive VW's turbo-diesel-powered vehicles, especially with a manual. 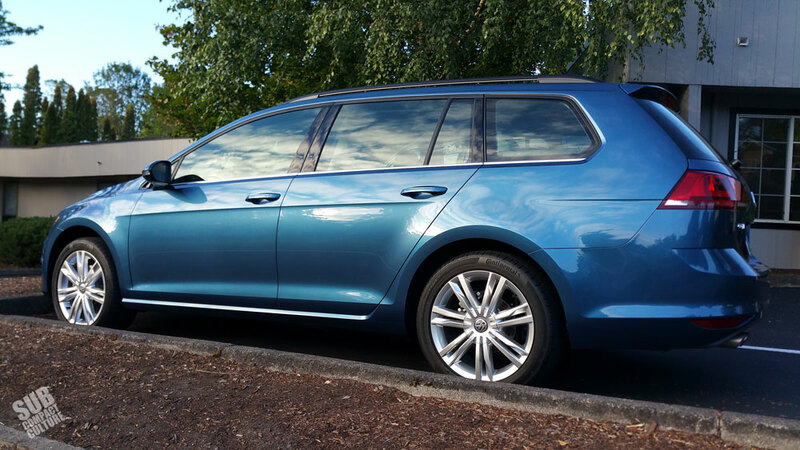 Even though this Silk Blue Metallic-hued SportWagen is the larger cousin to the Golf GTI hot hatch, it didn’t feel weighted down. It doesn’t handle as sprightly as the GTI, but it isn’t meant to. It handles nicely, has plenty of power when you need it, and has ample braking capability thanks to its well-proportioned front and rear disc brakes. 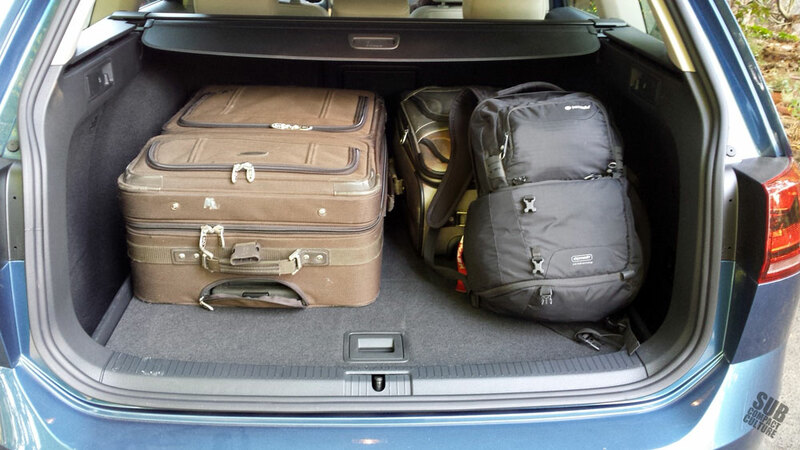 The SportWagen is meant to be a comfortable cruiser for 4–5 people; a car to take on long drives across the country. It begs to be driven long distances and scoffs at fuel stations when passing them. I could easily see hopping in this German-tuned rig and taking it from Portland, Oregon to Kentucky on a whim. It's one of those cars you could easily cruise at 80 MPH all day in (speed limit permitting of course); it feels very solid and planted at speed. We averaged a happy 38 MPG with this diesel during our week with it. 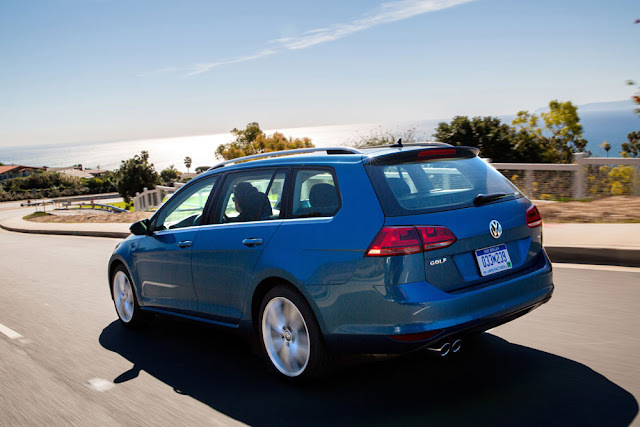 A job very well done seeing as the Golf SportWagen’s average ranges from 31 city/43 highway/35 combined. One item of note (and this is merely a preference thing)—the clutch uptake is very high, a tad sky-high to be exact. I found it difficult to shift this wonderful wagon quickly; I never got a good rhythm. Shifting normally, though, is a breeze. The shifter is nicely weighted; the gates easily defined and not sloppy. 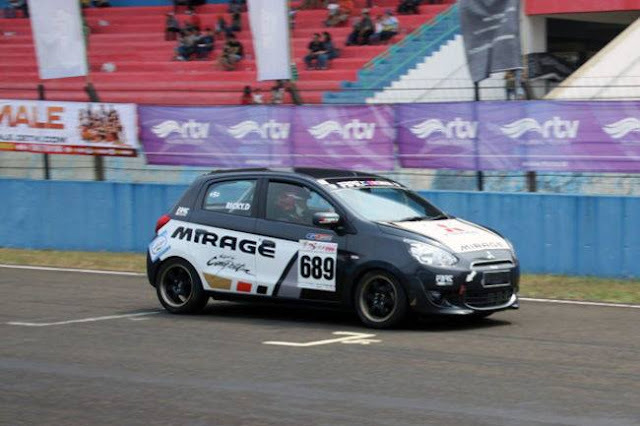 As many of you know, however, we have a TRD clutch and short-throw shifter in our 2007 Toyota Yaris and have a stock sport clutch in our 2013 Subaru WRX hatchback, so we're used to sporty clutches. The SportWagen’s high clutch release is typical VW and the same was said with the 2015 Golf GTI we just reviewed. A deal breaker? Nah, but something to note. 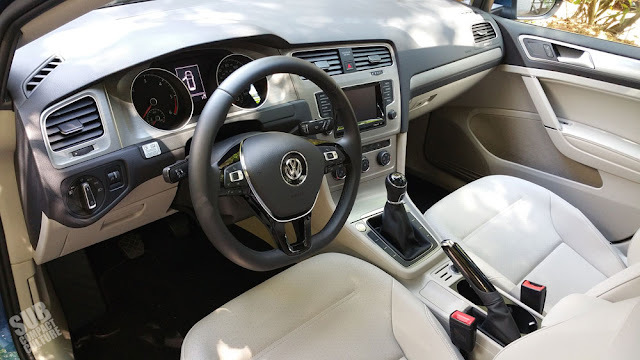 Exterior and Safety: As per all VWs, the exterior is classically styled; in tune with German-designed subtlety, with even and graceful body lines, and that ginormous panoramic sun-roof. Did I mention I love that thing? All-season tires wrap the factory 17” alloy wheels. Side indicator turn signals adorn the mirrors, and a host of safety accouterments are tucked into its body. This ride includes all the standard equipment other modern vehicles have, such as ABS, ESC, among others. It also has niceties such as a rear-view camera, heated and folding power side mirrors and washer nozzles, and rain sensing automatic front windshield wipers. So now that we know a bit about the exterior and safety, I shall take you inside. Interior: The beige leatherette interior is nicely accented with satin metal bands, a soft-touch dash, and a simple and elegant dash display and center stack. 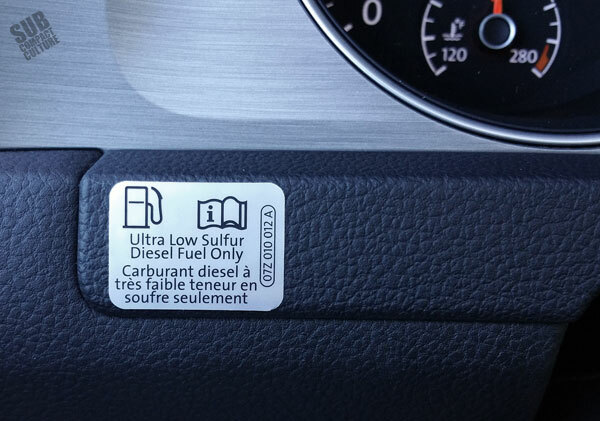 The heating and venting system is simple, understated, and allows for all vents to be shut completely off—even those in the rear portion of the spacious cabin. This might be something most people wouldn’t even care about, but for someone that has sensitive eyeballs, it is a must—and a happy item to see. Did I mention this ride also comes with a cooled glove box? This V-Dub comes equipped with a push-button start and a fabulous Fender premium audio system (that includes AM/FM, CD, MP3 playback, satellite, and Bluetooth capability). Somewhat amazingly, what this does not have is a USB port. None. Andy and I looked everywhere. We counted five, yes five, SD card slots but no USB port. For a nearly $30,000 car ($28,815 including destination to be exact), I would expect at least one USB port. Just one. If you can overlook that detail, it has all the rest to keep you happy. And that it did. The cabin was extremely spacious, it is easy to see out of and a breeze to fill with all of your junk, er, items for transport. 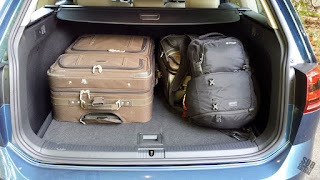 The rear trunk is deep and tall, making it a cinch to throw a few large pieces of luggage in for your cross-country trek I mentioned previously, or your trip to the airport, like we did. The cargo cover is one of the best-fitting we have found but had some things we felt needed refinement. The press-button and roll-back chases felt a bit chincy. The cover made a lot of racket when opening it, and got stuck at a few intermittent levels. I trust these “catches” where it got stuck were intentional (as to cover part of your stash if you had something tall you couldn’t cover), but they were more of a nuisance than anything. The cover material itself was adequate, and the design intention to cover over both top sides of the wagon was great. No one could see in no matter how you contorted your neck. But, at highway speeds with the windows or roof open, those areas would flap in the wind. Making a smacking sound akin to the game elementary school kids played, slapping around a large parachute while a beach ball was bouncing around in the middle. Was I the only one who played that game? Synopsis: All-in-all I was very impressed by the 2015 VW SportWagen TDI SE. It had plenty of power, will eat-up-and-spit-out miles without using much diesel, is very comfortable to ride in, enjoyable to drive, and is classically designed. Everything the Germans hoped for, and in our opinion, achieved. I enjoyed reading your article as I am contemplating the purchase of a VW Golf Wagon. It's hard to find cars any more with manual transmissions. Since manual cars are all i've ever owned, I was hoping to purchase another...not so easy. 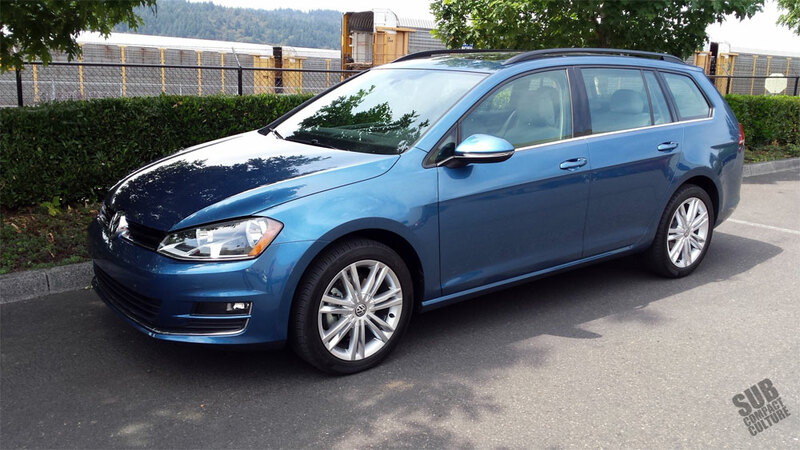 Your article suggested that you drove a VW Golf Wagon with manual transmission AND a sunroof. For the life of me, i can't seem to find that combination- really want manual, and a sunroof. 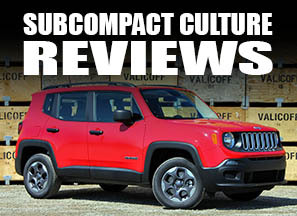 Could it have only been available in the 2015's but no longer in the newer models? I hope you get this comment/question.